Originally known simply as Chateau Milon, (its original name,) at one time the estate was known as the second wine of Chateau Lafite. The story about how this came to be is interesting. The owner of Lafite at that time was the Marquis Nicolas-Alexandre de Segur. King Louis XV called him The Wine Prince because of his extensive vineyard holdings in Bordeaux. The Milon vineyards were thought of as good, but of course, not as good as Lafite, which is how the wine came to be thought of the second wine for Lafite. In 1815, the Pauillac property was considered by some people as a fourth growth Bordeaux wine in the making. In those days, the wine was sold under the name of Chateau Mandavy-Milon. Between 1830 and 1840, the Casteja family became the owners of the estate from an inheritance. The label of Duhart Milon, according to family tradition came about from an old legend written about one of their ancestors, Sir Duhart. Sir Duhart, was rumored to have been a pirate for Louis XV. He settled at Pauillac for retirement. The “pirate’s house” on the Pauillac port existed up to the 1950’s. That original building inspired the label for the Duhart-Milon wines. The Casteja family remained in possession of Duhart Milon until the first part of the 20th century. At the time, Chateau Duhart Milon was one of larger Pauillac estates with around 50 hectares of vines. In 1937, the result of successive inheritances led to the sale of Duhart Milon. The Left Bank property went through five different owners in just 25 years. Coupled with the splitting up of the vineyards and the frost of 1956, the quality of Duhart Milon continued declining until the Rothschild family purchased the property in 1962. At that time of the sale, Chateau Duhart Milon included 110 hectares of land, of which only 17 hectares were planted with vines. The entire vineyard was in desperate need of replanting. Major renovations were urgently needed in the vineyards, which demanded work on the drainage and replanting. The size of their vineyards were also increased with purchases of other parcels adding to the size of their Medoc holdings. New cellars needed to be built as well. Chateau Duhart Milon remains one of the few 1855 Classified Growth estates without an actual chateau. Here, all you find are the cellars, vatting rooms and barrel storages. During the period of 1970 to 2000, the vineyards were almost doubled in size! 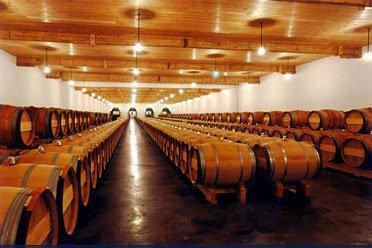 Additionally, they constructed new cellars, renovated and modernized their wine making facilities as well in 2003. By 2008, the wine of Duhart Milon increased in quality, stature and price. Much of the price increase had to do with the association with Chateau Lafite Rothschild, which had by that time, become the most in-demand, collectible wine in China. By the time the 2015 vintage was offered, prices had dropped to a more affordable price level. The 152 hectare vineyard of Chateau Duhart Milon includes 76 hectares of vines planted to 67% Cabernet Sauvignon and 33% Merlot. This makes Chateau Duhart Milon one of the few 1855 Classified Growths with only two grape varieties planted in their vineyards. The average age of the vines are 30 years old. The vineyard is planted to a vine density of 7,500 vines per hectare. The Duhart Milon vineyards are located in the north of Pauillac, on the western side of Chateau Lafite Rothschild, on the Milon hillside, which is not far from the Carruades plateau. This places the vineyard quite close to Chateau Mouton Rothschild and Chateau Clerc Milon. However, here, this is a slightly cooler terroir, due to its northern exposure. The naturally cooler soils provides more freshness to the wine, and allows for later picking. The terroir of Chateau Duhart Milon is a combination of gravel, sand and limestone soils. The Duhart Milon vineyards are unique in Pauillac, as the vines are for the most part, located in 1 single, large parcel. To produce the wine of Chateau Duhart Milon, vinification takes place in temperature controlled, stainless vats. Malolactic fermentation takes place in vat. Chateau Duhart Milon is then aged in an average of 50% new, French oak barrels for 14 to 16 months, depending on the vintage. There is a second wine, Moulin de Duhart, that was created in 1986. A third wine is also produced by the estate, Baron de Milon. The best vintages of Chateau Duhart Milon are: 2018, 2017, 2016, 2015, 2014, 2012, 2010, 2009, 2008, 2006 and 2005. Older vintages should be approached with some caution. Chateau Duhart Milon needs time in the cellar. But it can be enjoyed on the young side with decanting. Young vintages can be decanted for an average of 2-3 hours, give or take. This allows the wine to soften and open its perfume. Older vintages might need very little decanting, just enough to remove the sediment. Chateau Duhart Milon is usually better with about 8-12 years of bottle age. Of course that can vary slightly, depending on the vintage character. Chateau Duhart Milon reaches its peak maturity between 10-30 years of age after the vintage. Chateau Duhart Milon is best served at 15.5 degrees Celsius, 60 degrees Fahrenheit. The cool, almost cellar temperature gives the wine more freshness and lift. Chateau Duhart Milon is best served with all types of classic meat dishes, veal, pork, beef, lamb, duck, game, roast chicken, roasted, braised and grilled dishes. Duhart Milon is also good with Asian dishes, hearty fish courses like tuna, salmon, mushrooms and pasta. Because in part, the vines were young, the wine made at Chateau Duhart Milon during the 1960’s, 1970’s, 1980’s and into the first part of the 1990’s, honestly, the wines were not as good as they should have been. That changed starting with the 2000 vintage. Chateau Duhart Milon also became expensive in 2009, because of massive, increased Asian demand for the wine, due to the fact it shared ownership with the First Growth estate, Chateau Lafite Rothschild. However, by 2012, prices had slipped on the wine, making it more of an attractive purchase. A medium-bodied wine with an emphasis on the stylish black raspberry and cassis core, there is softness, sophistication and purity with refined tannins and tender fruit in the finish. The wine was made from a meld of 76% Cabernet Sauvignon and 24% Merlot. Floral, black raspberry, tobacco and wet earth scents create the nose. Medium bodied with an elegant palate, the fruit radiates with a fresh, sweet quality and ends with juicy, ripe dark cherries. The wine was made from a blend of 67% Cabernet Sauvignon and 33% Merlot, which was picked September 26 to October 12. It is the elegance and purity in the sweet, red berries that stand out here. Forward, soft, refined and complex, the wine is fresh and the textures exude grace. Give it 4-5 years in the cellar. Nice wine indeed, but the 2016 is so much better. That in itself does not take anything away from the fresh , vibrant character here and all its complexities offered here. Tobacco, cedar, cassis and lead pencil on the nose. The medium bodied wine is fresh, lively, with a blend of black cherry and cassis with an energetic, spicy, lively finish. Give it at least 8 more years to come around. Plus, for some odd reason, there was a huge infestation of grape eating snails that loved eating the Cabernet Sauvignon, which has added more fatness to the wine. Closing up, it took effort to find the cassis, tobacco and olive notes. Medium/full bodied, soft textures and a fresh, cassis and dark red berry filled finish are found in this elegant Pauillac. Medium.full bodied, elegant, finesse styled Pauillac with a focus on freshness, silky, smooth tannins and ripe cassis, blackberries, earth, thyme, tobacco and cedar wood aromatics. On the palate, the wine is fresh, sweet, lively and serves up ample, ripe, sweet, spicy fruits in the finish. Still young, there is not much in the way of secondary development yet, but there is such a wealth of ripe fruit and silk tannins, like many 2009 Bordeaux wines, they can be deceptively easy to drink in their youth. The wine was made from a blend of 63% Cabernet Sauvignon and 37% Merlot. Far too young, but someone has to taste these in the name of science. With air and effort, smoke, tobacco, blackberry and earthy scents leads to a fresh, crisp, tannic, young Pauillac with good concentration that will be more fun to drink in 6-10 years. From a blend of 73% Cabernet Sauvignon and 27% Merlot, the wine reached 13.1% alcohol. Fully mature, medium bodied, with crisp, bright red fruits, hints of tobacco and green forest notes, that finishes with fresh, cherries. Medium bodied, fresh, classic and still youthful, the red berry, tobacco, lead pencil and cedar nose brings you to a medium bodied, crisp, soft, but firm palate. Time should help this wine soften and expand. From a blend of 70% Cabernet Sauvignon and 30% Merlot, this Pauillac wine offers cedar wood, tobacco, cassis and spicy blackberry notes. Tannic, structured and filled with ripe, juicy cassis, this Bordeaux wine needs at least another 5 years before it really starts to open up. Sadly, due to its connection to Chateau Lafite Rothschild, this attractive wine has become far too expensive for its quality. The first wine announcing the reemergence of Duhart Milon is medium bodied, finesse styled and displays an elegant, fresh, bright, crisp, cassis, black cherry, earth, and tobacco nosed profile, there is good freshness to the fruit and a softness to the tannins. The wine was made from a blend of 71% Cabernet Sauvignon and 29% Merlot. From a blend of 71% Cabernet Sauvignon and 29% Merlot, this vintage of chateau Duhart Milon is filled with aromas of creme de cassis, cedar wood, earth, tobacco and spice aromas that lead to a medium/full bodied Bordeaux wine that is already starting to show well. With round tannins and soft textures, this cassis and chocolate filled Pauillac will add complexity and softer textures with another 6-8 years of bottle age. Starting to open and show nicely with a short decant, the wine medium bodied, fresh, lively and offers fresh, red fruits, earth, cedar, herbs and tobacco leaf. Classic in style, the wine was made from a blend of 80% Cabernet Sauvignon and 20% Merlot. Light in color with noticeable bricking , scents of cigar box, forest floor and dark berries are easy to find. Medium bodied, with no tannin remaining, the wine is drinking at full maturity. At close to 65 years of age, this was ready for retirement. Fading, but with the unmistakable character of a Pauillac, the cassis, cranberry, tobacco and cedar personality is still holding on, albeit just barely. The wine is light in fruit, weight and finish. Musty on the nose, cedar, leafy, forest floor notes poked through. Medium bodied, with soft, round, supple textures and just a bit of spicy, red fruit in the finish. This would have been much better without the musty nose. Other bottles could be better, or not, depending on the provenance.